R. Solomon Raj founded Jehovah Jireh Ministries in May of 2003. He chose this name because Jehovah Jireh means "God is my Provider." Solomon felt so truly blessed that he wanted people to know why - because his Lord and Savior Jesus Christ had provided him with Salvation and a different life than he had seen lived by most people. He wanted to share the Good News of deliverance and freedom, and he wanted the ministry name to reflect what the Lord had done for him. 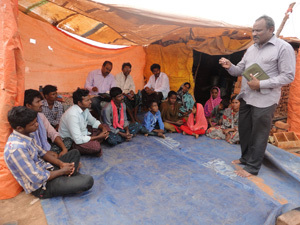 Through the support of AndyBooks Outreach, Pastor Raj and a team of evangelists have been able to share love, food, clothing, shelter and the Gospel with many tribal peoples in Andhra Pradesh, India. When we started the Outreach Solomon would walk for days to villages to share the Gospel. Our first purchase was a motorcycle so that he could cover more ground more quickly. We have grown much since then. We have distributed hundreds of Bibles to new converts, and we follow up with them in discipleship.